During the Revolutionary War, Sephardic Jews fled British-occupied New York to become the first Jewish families in Connecticut. 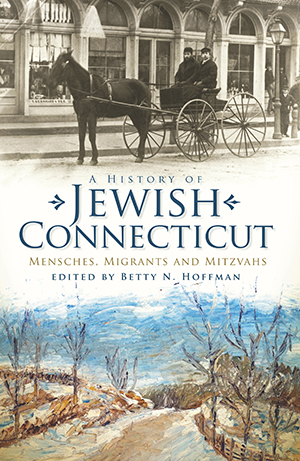 This long Jewish history is explored in a collection of essays by historians and community members across the state, from colonial times and the role Jews played in the Civil War to memories of summer nights at Lebanon's Grand Lake Lodge and Danbury's Lake Waubeeka. Join editor Betty N. Hoffman and company as they recount tales of Kid Kaplan, the "Meriden Buzz Saw," who became boxing's 1925 Featherweight Champion of the World; the Lender family, who "bagelized America"; and the graceful personal service of Marlow's Department Store in Manchester to reveal a fascinating and intimate portrait of Jewish Connecticut. Betty N. Hoffman, PhD (anthropology), has conducted oral histories in and written extensively about the Greater Hartford Jewish community for many years. Her varied academic career includes teaching anthropology, social science research methods and English as a second language, as well as academic and business writing at various local universities and businesses. She is currently president of the New England Association of Oral History. Her most recent project was interviewing several of the informants and writing the script for the documentary film Pride, Honor and Courage: Jewish Women Remember World War II (JHSGH 2009). Dr. Hoffman's publications include: Jewish Hearts: A Study in Dynamic Ethnicity in the United States and the Soviet Union (SUNY Press, 2001); "Witness to War: 1941, 1945: The Soviet Jewish Experience," Connecticut Jewish History (JHSGH, 2001; Bruce M. Stave, ed. ); Honoring the Past: Building the Future: The History of the Jewish Federation of Greater Hartford (JHSGH, 2007); Jewish West Hartford: From City to Suburb (History Press, 2007); and Liberation: Stories of Survival from the Holocaust (Enslow, in press).